Chameleon in Temple Bar has had an enduring presence on the Dublin Food Scene since the mid 90’s and recently celebrated its 20 anniversary. An outstanding achievement indeed, in an industry where only a mere 7% sees it through their first birthday. It is run by husband and wife Kevin & Carol O’Toole, While Carol oversees the Front of House and business side of things, Chef Kevin takes great pride in the attention to details required to produce Award-Winning food in his kitchen, showcasing Irish produce – Wicklow Lamb,Rare breed Fermanagh black pigs, Broightergold’s rapeseed oil, Highbank Orchard’s Ciders, 8 degrees brewing craft beers among a few. Chameleon picked up Best World Cuisine at the Irish Restaurant Awards 2013. The influence here at Chameleon is Indonesia, often referred to as the World’s largest Archipelago, with more than 18,000 islands, it has a Culture steeped in history, so not surprisingly,with such a rich mixture of cultures, the Cuisine varies from region to another or whichever of it’s many islands you visit. It can be fiery or enticingly aromatic but always full of fantastic flavours with subtle undertones from the use of a huge variety of Spices , Herbs & various Soy sauces . Hence good Culinary skills , Palate and a nose is a must in it’s execution, as there is no secret to making the most perfect and tastiest dishes , it all lies in the tasting and balancing of flavours. I love Kevin personal take, inspired by Indonesian Culture and tailored for an Irish audience, such the Ox cheek beef Rendeng cooked only once, ”Malaysian style” as opposed to the twice cooked drier Indonesian version, all because we do here in Ireland like a bit of extra gravy. In keeping with popular demands and trends of the bohemian quarter of Temple bar, they opened the Spice Bar downstairs in Chameleon in January 2014. 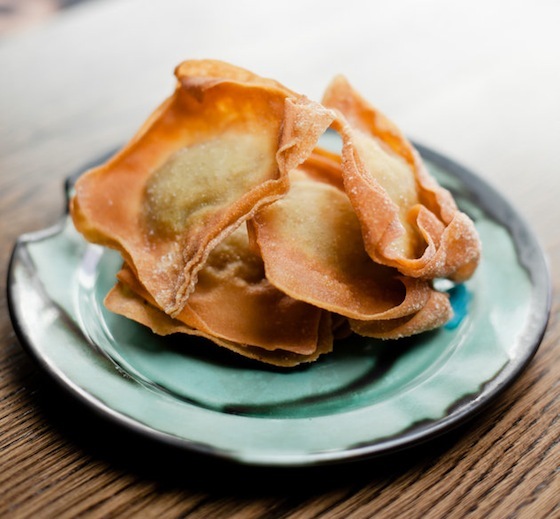 This new concept has worked rather well for all concerned, allowing people to choose their favourite “ tapas style “ along with a glass of wine or an artisan craft beer while the upstairs restaurant continues to serve the traditional “ Rijst-Tafel “. This has allowed the Chefs to play with specials and seasonal produce such as Irish Scallops, goat, mushrooms etc.. as well as offering full vegetarian and coeliac menus option. 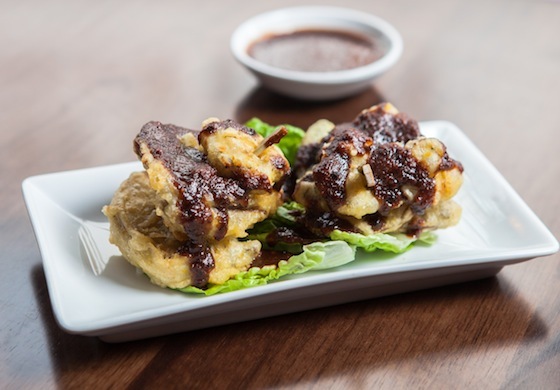 Bumbu Bali Mushrooms were crisp marinated portobelo & chestnut mushrooms in a lacy tempura batter served with Chameleon’s own spicy peanut sauce. Deliciously succulent, they were perfectly cooked , soft with a moist golden crunchiness and melted in the mouth. The peanut sauce with enough lime to balance out the garlic and ginger of the marinating curry paste. 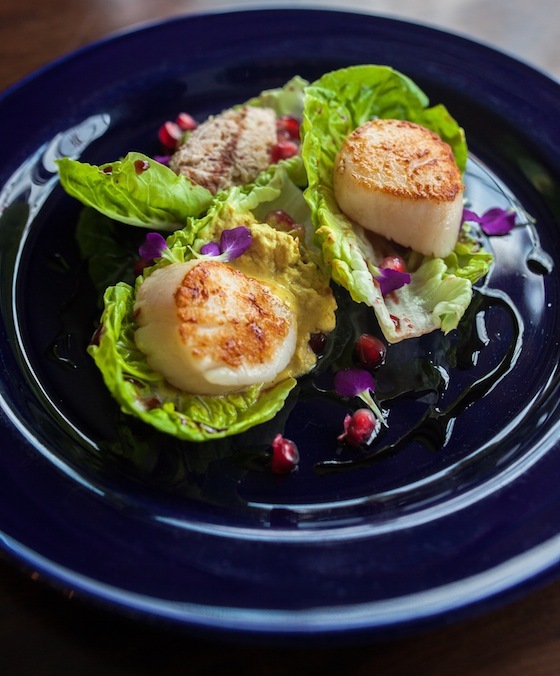 Scallop Bumbu Bali were Irish king scallop in a bumbu bali sauce, balinese foam & pomegranate reduction and crab.The scallops were perfectly cooked, silky, juicy and full of flavours while the crab had a refreshing smack of granny smith apples & subtle hint of chilli. I could have eaten a massive amount of these and nothing else. 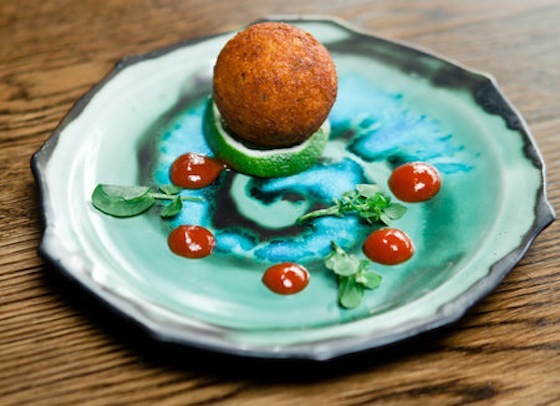 Next the Otak otak pipeh was a Crab Cake with hake, asian herbs, ginger, garlic and chillies coated in panko crumbs. With enough Hake to add substance and not overpower, some sweet potato enchancing the sweetness of the Crab Meat coupled with the sweet & sour of the Mango Chilli Sauce, this little gem delivered a glorious mouthful of Sunshine on the palate. 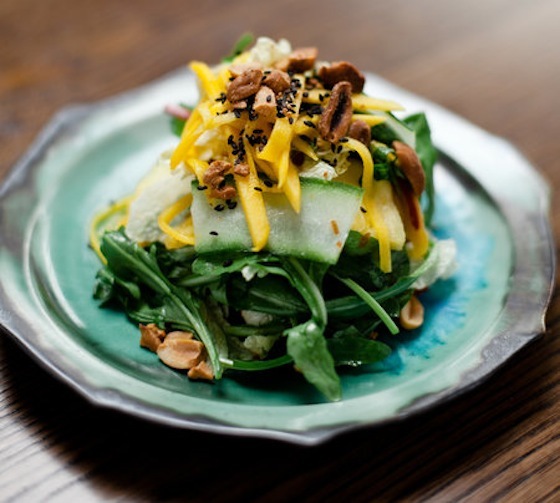 A side of Asinan salad was a mix of Chinese leaves, pak-choi, coriander, cucumber shavings, shredded mango & pineapple in a galangal and shallot dressing. Here the simple ingredients of the dressing, where the shallots and galangal are browned and caramelised in Broightergold Rapeseed oil transforming all the simple ingredients into a harmonious plate of flavours. For additional textures with a Crunch factor , came Pangsit goreng were Crispy fried Pork Wontons served with a chilli sambal. Slow cooked pork belly is used here as the filling. It fell apart on the first bite with a subtle hint of ginger, cumin, fennel & scallions .Oh…. My … need I say more? Only that they were demolished in a flash. The famous Perkedel followed, a crisp Potato cake with Chick peas and Curry Leaves. 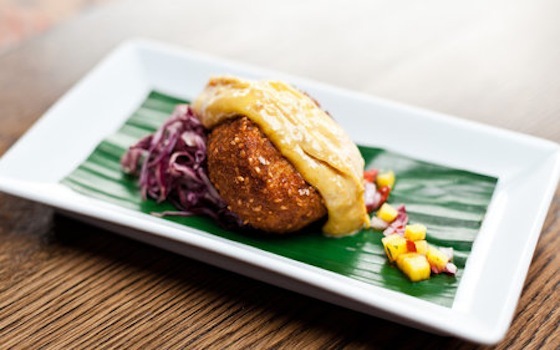 It was served on a little mound of finely shredded red cabbage , enrobed with the most delish pickled aubergine mayonnaise & a mango chilli salsa. This Indonesian style potatoe cake had some lovely textures to it, which came from some finely diced vegetables. The Pandang leaves were wonderfully aromatic and all encased in a golden crispy coating of Panko crumbs and toasted sesame seeds. The final dish of braised Ox Cheek Beef Rendeng was wonderfully rich and fragrant, slow cooked it was very tender and juicy and fell apart on contact and practically melted in the mouth. 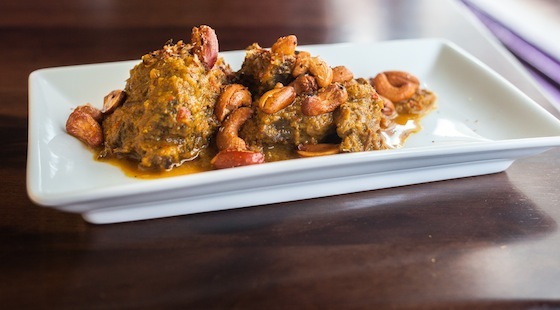 A perfect harmony of flavours with undertones of tamarind and coconut. It was full of fantastic flavours & offered a very real feel good factor. This was a pure Celebration of Indonesia and indeed a glorious feast that took me back to very happy memories of holidaying in Bali. This adaptable couple are looking forward to what the future holds for their enduringly popular gem of a restaurant and Award -Winning Food. Soon, you will be able to purchase some of their produce at the weekly food market in Temple Bar & sample some of their food at the Temple Bar Taste Trail at the end of January 2015. I don’t know about you but I will without doubt be stocking up on their One pot Sauces & Pickled Aubergine Mayonnaise. Check out our competition to win a Dinner voucher for 2 at Chameleon . There are two up for grabs so Best of Luck & enjoy.